Sometimes you just feel like leaving behind the drudgery of work, closing those books and fleeing the office for mañana-land, eating some ceviche and washing it down with a cold cerveza. And you know all it takes is a drive south. It is not as far as you may think; you can get a taste of old Mexico just 30 miles south of Portland, Oregon. Woodburn, an unassuming town in the heart of Marion County, offers the charms of south of the border without venturing far from the metropolitan area. "Summer was dusty in Woodburn. On the stage roads the dust was 10 inches deep," reminisced Della Stamps about life in the town in "the Gay 90's," not two decades after the town's founding. Named after the dramatic slashing and burning that were carried out to clear the land, the lumber-based settlement of yesteryear has changed in unexpected ways. The dust still drifts through in the heat of August and September, but since the roads now reaching this one-time railroad town are paved, it does not reach the same heights. Nonetheless, in those months, it gives this 120-year old town the sleepy, slow-paced aura associated with rural Mexico. From the benches lining the small but clean Woodburn Downtown Plaza you can enjoy a trickling of a traditional stone fountain. Looking around, the signs advertise seafood, baked goods, clothing and shoes - all in Spanish. Some Saturdays a troupe practices ancient Aztec ritual dances. And by the end of 2006 "We'll have a gazebo like [there are] in Mexico," says Javier Perfecto of the improvements to the park, which not long ago was an arid parking lot. Mr. Perfecto, the Community Relations Officer is a key liaison between the city's government and services and its diverse communities. His role is crucial since up to 51% of the 23,000 residents are of Hispanic origin. Tellingly, the main health clinic is named "Salud de la Familia," literally "family health." Many recent Latino immigrants to the area gravitate to Woodburn "because it feels like home- some even call it 'little Mexico' - it's comfortable," he adds, pointing out that the city even issues a bilingual newsletter, which goes a long way to integrate this group into the town's everyday life. If there is a sense of accomplishment in his voice, he comes rightly by it, since he produces the Spanish language content. He also works with KWBY, the Latino radio station, to inform the town's largest community about news and events. Considering the size of the Spanish-speaking audience, the motives behind the adaptation of the local media and government is self-evident, but it is a relatively new development in Woodburn's history. Only 20 years ago, the high school estimated its Latino population only around 24%. Around the middle of the 19th Century, this territory was mainly used by French fur trappers. In 1871, Jesse Settlemier scored a bargain at the contemporary version of a government auction, pledging $5 per acre, and in 1878, he laid out a town along the Oregon and California Railroad. Fifty years later, Settlemier's gamble had grown over ten times its original size, and it had become the "World's Berry Center". The Arch commemorating that fact only stood 10 years along the highway leading into town, before it had to be removed to make room for the road's expansion in 1933. Then, in the 60's, a series of developments changed the face of the town in a radical way. Migrant workers from Mexico and Central America who started coming through as part of the Bracero program over a decade earlier began settling. A wave of Russian and Turkish Old Believers (an Orthodox Christian sect), fleeing further persecution in their former refuge within Communist China, started arriving and also taking root. The opening of Senior Estates brought an influx of more 2500 people over 50, creating Oregon's largest retirement community. By 1970, it was reported that "strictly speaking, there are no minorities in Woodburn." Then, as now, though it may seem surprising, the only trouble in the town is related to traffic. The most significant project currently occupying the city government is reconditioning roads, laying sidewalks on main thoroughfares leading to the high school, and paving gravel streets such as No Name St. north of downtown. As in the rest of the state and country, Hispanics have been the fastest growing minority, becoming recently Woodburn's majority. Other changes brought about by this development were the institution of bilingual education in the school district, in effect creating a dual immersion program. Settlemier Park, which honors the town's founder, became decades ago the location for an annual Fiesta Mexicana under its 40 varieties of shade trees (since then transferred to Legion Park). The yearly Music in the Park festival this year featured Celtic songs, American oldies, a Gypsy violin virtuoso as well as a marimba band. Obviously, despite its prevalence, the Hispanic influence of the town does not entirely eclipse the other cultures. Living up to its moniker of "City of Unity," members of the entire community participate in the monthly cultural events organized by the local library and government. St. Luke's Catholic Church provides services in Spanish and English, and on any given Sunday Old Believers can also be seen throughout the town in their rubashkas and sarafany. Yet, in Downtown Woodburn Plaza, the flavor, color and smell that predominate is that of tamales, the dusky brown of champurrado, and the wafting scent of pan dulce from the universally loved landmark, Salvador's Bakery. In Woodburn, American life takes another shape. Rather than a melting pot, it is more like a taco salad. Come on down and have a taste! About Woodburn, Oregon: A picturesque town in the heart of Marion County, Oregon. 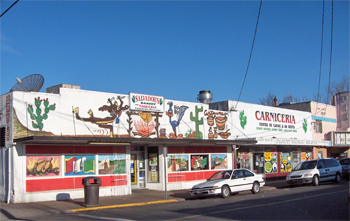 A rich agricultural history is now complemented by great shopping opportunities: Mexican foods, products and mementos downtown; brand-name shoes, clothing and house wares at the outlet mall on the edge of town; fresh fruit, vegetables and nursery plants throughout the country in the vicinity. What to bring: An English-Spanish dictionary if you feel adventurous or want to practice your language skills, but it is not entirely necessary. Most of the Spanish-speaking population of the town is bilingual. Tips: Take your time looking around in the shops; bargains can be found everywhere, whether shopping for folk art or cowboy boots. History: Founded by Jesse Settlemier in 1871, it was incorporated in 1889. He encouraged influx by giving land claims to anyone who pledged to build on them. Settlemier and Simon Reed basically gambled against each other when they struck a deal to run the tracks for the Oregon and California Railroad through the town. Although neither man lost, it was Reed's expectations to own the land that were crushed by Settlemier's success after platting the town along the railroad. Many of the early settlers' Victorian homes still sport the brightly painted gingerbread of the time. Ceviche: lime-cured seafood, usually served on tostadas. Cerveza: Beer; most Mexican brands light and lager styles. Champurrado: Hearty hot chocolate and cornmeal drink. Rubashka: Embroidered tunic worn by male Old Believers. Sarafany: Calf-length floral print dresses worn by female Old Believers. Pan dulce: Literally "sweet bread," traditional Mexican baked goods. Story by Vicente Guzman-Orozco, a free-lance writer based in Portland, OR.